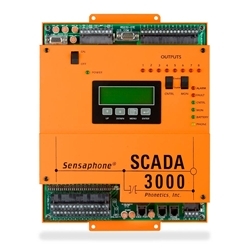 The Sensaphone SCADA3000 Monitoring System offers a comprehensive solution for an industrial setting. Monitor and control your pumps, calculate flow, record run times, generate reports and alarms – all from the SCADA 3000. With its universal input support; the SCADA 3000 can monitor your 4-20mA transducers and pulse counters... as well as any environmental factors you may encounter. This expandable system will support up to 144 I/O points to meet the most demanding sites. Now, your industrial location can enjoy the protection offered by a comprehensive monitoring, alarm notification, system control, and data-logging. The Sensaphone SCADA (Supervisory Control and Data Acquisition) 3000 Monitoring System communicates with a host PC through RS-232 serial, radio modem, or standard telephone lines and runs a powerful, 32-bit Windows®-compatible software application that allows users to manage multiple host units. The built-in keypad, speaker, and four-line LCD display make local programming simple. Individual software modules control programming, screen design, control program editing, and data-logging actions. Capabilities: The system includes 16 inputs as standard – expandable to 136 in total. Input options include dry-contact, 10K, and 4-20mA modules. These inputs allow users to monitor a variety of conditions; including temperature, water, humidity, and more. Available expansion I/O modules can add universal/pulse-count inputs and relay/analog outputs. Features: Eight standard universal output relays – expandable to 128 in total – can switch external devices on or off automatically or manually. The output can even control a thermostat to adjust site temperature remotely. Alerts: In the event of an alarm, the system can send one of 64 custom-recorded voice messages – or alert you by way of a text message, page, or e-mail.